The butterflies are fluttering, the birds are chirping, and the nectar plants are in. This week, the San Diego Zoo Safari Park’s Butterfly Jungle opens to the public, and the excitement is palpable. Thousands of butterflies from more than 20 species will flitter around guests as they make their way through the tropical Hidden Jungle aviary. 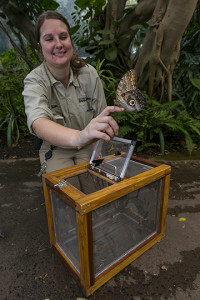 Safari Park visitors will get the chance to see butterflies from Asia, Africa and Central, South and North America—including the electric blue morpho, the exotic giant owl, and the brilliant orange Julia. There may even be a surprise species or two this year. “We are always pleasantly surprised if we get an unusual species that is on our import permit, and so will our guests be,“ said Michael Mace, curator of birds at the San Diego Zoo Safari Park. “With 20 species of butterflies, there’s every color, shape and size for everyone.” Guests will also be mesmerized by the lush greenery and many exotic birds that populate Hidden Jungle, such as red-crested turacos, African pygmy geese and beautiful sunbirds. 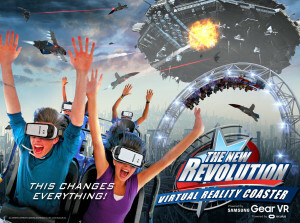 Six Flags Magic Mountain, the undisputed thrill capital of the world, today announced final details for The New Revolution, North America’s first fully-integrated Virtual Reality (VR) roller coaster from Samsung Gear VR, powered by Oculus, to develop a multi-dimensional virtual coaster experience. The Valencia-based theme park stays true to its history of launching coaster thrills to new and unprecedented levels of exhilaration by immersing riders in a completely virtual world. From the moment riders board and don Samsung Gear VR, the traditional roller coaster experience is transformed. High-definition imagery and storytelling syncs with the unique track configuration creating a one-of-a-kind seamless “real world” to “virtual world” thrill ride experience. Riders now become co-pilots seated in the cockpit of a true-to-life fighter jet, flying through a futuristic city while virtually engaged in a battle to protect the Planet against alien invaders, all while racing over the 3,500 feet of twisting, turning, looping coaster track.